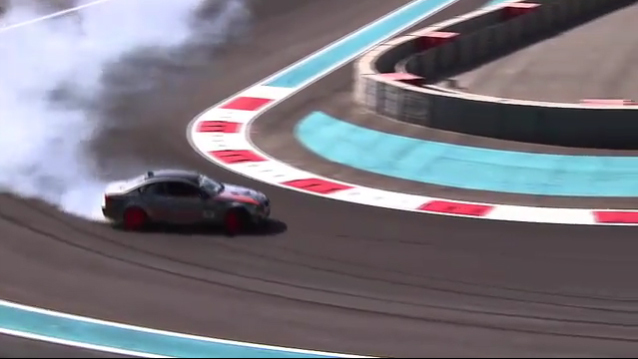 In a preview of things to come from the Formula Drift Abu Dhabi event this video was released of the two Mikes (Mike Essa and “Mad” Mike Whiddett”) drifting the Yas Marina Circuit. You can instantly tell by watching the video that despite being built for Formula One racing, Yas Marina Circuit seems perfectly suited for competitive drifting! Also the way Essa’s BMW V10 engine echos off the grandstands is epic! If you’re bummed out that you can’t watch the event since it is on the other side of the world then cheer up! Formula Drift Abu Dhabi will be broadcasted live on Feb. 25th via Driftstream just like any other Formula Drift event. However there is a catch, since it will be live and there is a massive gap in the time zones between America and Abu Dhabi you will have to wake up pretty early to watch the event live. For you east coasters the stream will begin at 8:30am. For us here in the west the stream starts at 5:30am (ouch!). So far, it has not been confirmed if the event will be available on-demand after the live broadcast but I will keep you posted as soon as I know. In the meantime watch the video below for a preview of things to come. UPDATE: It was just confirmed by Driftstream on Drifting.com that the event will be available on-demand after the live broadcast. So if you love drifting but not enough to wake up at 5am the Driftstream has you covered!